Structure seems to fit an area 100 miles south to 200 miles north of Sioux Falls. Mono-slope barns are a profitable way to feed beef cattle, according to one South Dakota beef producer. 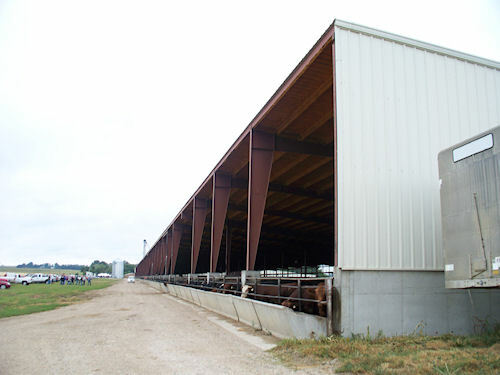 Goodwin Heritage Cattle, Inc., located near Goodwin, S.D., has been fattening beef cattle in their sprawling mono-slope barns since February 2001. Their largest barn is 1,080 feet long by 100 feet deep. The open south walls of their barns soar to 28 feet in height, enabling the structures to catch even the slightest zephyr. "There's always a breeze in the barns," says Mike Gibson, barn manager at Goodwin Heritage Cattle. "It's 10 to 15 degrees cooler in the barns than the outdoors in the summertime, and 10 degrees warmer in the winter." There's always a breeze in Goodwin Heritage Cattle's 1,080-foot long and 100-foot deep monoslope cattle finishing barn. The north walls of their barns have curtains that are used to help manage airflow. "We saw zero additional death loss in our barns during this summer's heat wave," says Gibson. "And because our cattle don't have to deal with mud, we never see any feet or leg problems. In a test we ran, cattle housed in our barn finished 30 days sooner than an identical group kept in an open feedlot." "This type of barn exists in a band that starts at about 100 miles south of Sioux Falls and extends up to about 200 miles north of Sioux Falls," said Kris Kohl, Extension Agricultural Engineering Specialist at Iowa State University. "Farther south of that band, there's enough solar energy to evaporate moisture from the manure and keep feedlots relatively dry. That would obviously vary with the number of square feet allotted per animal." Gibson says that one thing he would have done differently would have been to coat the barn's ceiling with spray foam insulation as soon as the structure was completed. "The roof began to develop pinholes after a few years, so we had the ceiling power washed and covered with a layer of sprayed foam insulation," he says. "Other than that, there isn't a thing I would change about our barns!"